Hazardous conditions expected to peak during Tuesday’s morning commute for most of New York State. Photo by: Governor Andrew Cuomo, via Facebook. Albany, NY - December 28, 2015 - Governor Cuomo advised New Yorkers to prepare now for dangerous weather conditions that will be moving into New York tonight into Tuesday which will make for dangerous driving conditions, especially during the Tuesday morning commute when snow transitions to sleet and freezing rain in many areas of the state. 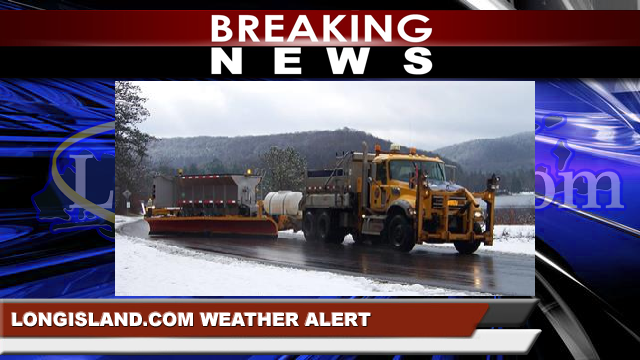 The National Weather Service has issued Winter Weather Advisories for all of New York. A surge of moisture will expand northeast across the state from late this afternoon into Tuesday as a mixture of snow, sleet, freezing rain and rain. Additionally, High Wind Warnings have been issued in southern Erie County and Chautauqua County. Snow will arrive tonight into Tuesday and accumulations of 1 to 3 inches are possible in the central and eastern portions of the state, mainly near and north of I-90, while accumulations of 2 to 4 inches are possible in the North Country. Up to 4 to 8 inches may occur in northern portions of central and northern New York State. Expect a treacherous travel commute Tuesday morning in many areas of the state as snow changes over to sleet and freezing rain, with untreated surfaces remaining slippery throughout the day Tuesday. Isolated to scattered power outages will be possible where the greatest ice accumulations occur. The New York State Department of Transportation has more than 430,000 tons of road salt on hand and more than 3,300 operators and supervisors statewide ready to respond with 1,277 large plow/dump trucks, 176 medium plow/dump trucks, 16 pickup trucks with plows, 306 loaders, 41 truck/loader mounted snow blowers, 37 tow plows and additional resources as necessary. Additionally, variable message signs will display critical weather warnings. In the event of damage caused by wind and ice, NYSDOT has 10 bucket trucks and 82 chippers standing by. Motorists are reminded to check 511NY by calling 511, or by accessing www.511ny.org before traveling. This free service allows users to check road conditions and transit information. Mobile users can download the updated, free 511NY mobile app from the iTunes or Google Play stores. The app now features drive mode, which provides audible alerts along a chosen route while a user is driving, warning them about incidents and construction. Users can set a destination prior to departing and receive information on up to three routes. The New York State Thruway Authority has 518 operators ready to deploy 201 Large Snow Plows, 142 Medium Snow Plows and 54 Loaders statewide. The Thruway Authority has more than 140,000 tons of road salt on hand throughout the system. Due to the High Wind Warnings issued by the National Weather Service for Chautauqua and Southern Erie counties, high profile vehicles including empty trailers should take caution when traveling on I-90 between exits 55 (Lackawanna) and 61 (Ripley – Shortman Road). Subject: LongIsland.com - Your Name sent you Article details of "Governor Cuomo Urges Caution on the Roads as Snow, Ice and Freezing Rain Move Into the State"